"We think it is prudent to plan for periods where the amount of electricity generated from wind is low at times of peak electricity demand" Source: National Grid consultation 2009. Renewable Developments Wales works with landowners to develop, consent and finance medium to large scale peaking plant projects in Wales. 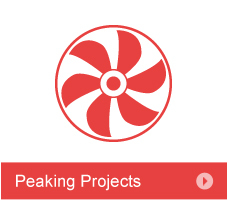 If you would like further information or are interested in a peaking power generation project on your land, please contact us for more details. Peaking plants are quick response power generating plants that provide power at times of peak demand. This often happens when there is a surge in demand associated with a particular event; a typical example being the ‘ad break’ effect where many people across the country boil kettles following the end of a popular television programme. Peaking plants also help to quickly ‘balance out’ the grid at times when other generating technologies (e.g. wind and solar plants) cannot generate electricity due to the weather conditions. With the increasing number of wind turbines that are now providing electricity to the National Grid and the large number of c.5 MW solar farms being proposed, both of which represent an intermittent power supply, there is significant consideration being given to the need for reactive/peaking power on the network. Peaking plants seldom operate; typical hours of operation being no more than around 5 per cent of the year. However when they do operate, they have the ability to respond very quickly to demand and are vital in smoothing the availability of power in the grid. Peaking plants represent embedded generation and are ideal as a support to wind and other ‘green’ power sources.